Our hometown golden boy, Jeremy Laing, has made his mark on the international scene as a young, contemporary designer with an eye for modern design exalted for its timeless sophistication. Influenced by the Belgium School’s take on fashion, Laing’s Autumn/Winter 2012-13 RTW collection, shakes the designer’s eponymous label out of its minimalist mindset and takes it for an enraptured roll in the hay with bleach and floral prints. 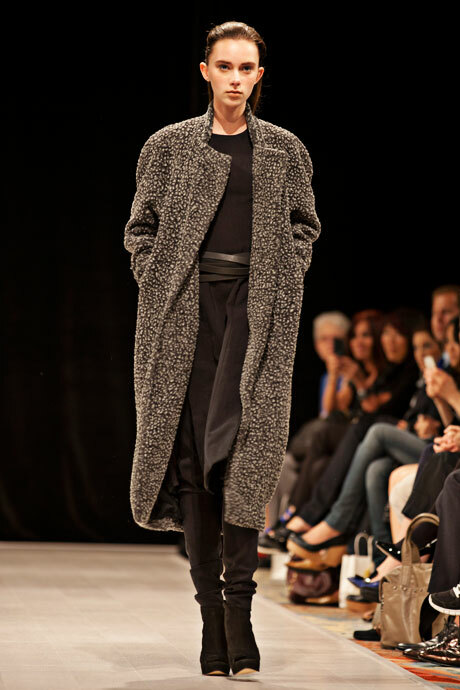 Leave it to Laing to utilize the mutability of leather, a principal material in the designer’s most recent collection. The exceptional tailoring demonstrated in the cut of architectural jackets and the drape of a magnificent full leather dress, re-imagine 2012’s “it” fabric’s material makeup, reminding the runway audience at The shOws, that revolution and trend need not be contrary terms.